There are many types of flies that affect our area, the two most common are the fruit fly and the common house fly. Other species include: phorid flies, fungus gnats, drain flies, bottle flies and cluster flies. Flies breed in animal waste and decaying organic material from which they can pick up bacteria and viruses that may cause human diseases. Small fruit flies are about 1/8 of an inch (3-4 mm) long, including wings. House flies are about 1/8-1/4 of an inch (4-7.5 mm) long and the female is larger than the male. House flies are general feeders on liquids and are attracted to many substances, from excrement to human foods. House flies can liquefy solid foods by regurgitation. Fruit flies develop on fresh fruits and vegetables, such as bananas, grapes, peaches, pineapples, tomatoes and fermenting liquids, such as beer, cider, vinegar and wine. When fresh materials decay they are less attractive to these flies, due to bacteria and fungi. 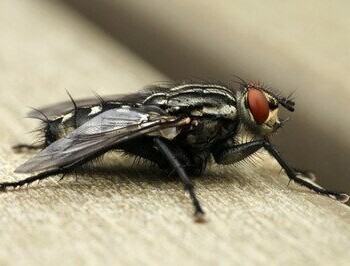 House flies excrete and regurgitate whenever stopping to rest. They tend to transmit disease organisms, especially those associated with filth. Small fruit flies are also able to transmit human diseases. Getting rid of flies can be a difficult task. Removal of larva development sites by emptying, cleaning and drying garbage containers is extremely important. Other control methods include securing screens, sealing holes and installing various types of traps. Contacting Wil-Kil Pest Control is the ideal way to control your fly problems. We offer highly effective fly control that is sure to help alleviate the pest problem. Do-it-yourself sprays and treatments are not always effective in resolving fly problems and may contain chemicals that are harmful to people and pets if mixed improperly. Wil-Kil Pest Control professionals are trained in identifying fly infestations and breeding sites and will implement effective measures to control fly populations in your home. The health and safety of our customers, their family or employees is important to us and that is why we only use products that are EPA registered for pest control use. All of our pest control professionals are registered and licensed by the state or local jurisdictions where we provide service to ensure proper application. At Wil-Kil Pest Control we make every effort to be with you as soon as possible. In most cases we can respond on the same or next day. Flies are difficult to prevent, given their ability to breed on the food we eat. If flies have infested your property, call Wil-Kil Pest Control as soon as you spot them to prevent a larger fly problem. Does Your Milwaukee Home Feel Like A Flea Circus? If might be fascinating to watch tiny fleas doing amazing feats of strength, swinging on a trapeze, diving from a high place into a pool of water or being fired from a canon, but in your home, they are far from entertaining. Fleas leave itchy, irritating bites on you and your pets--bites that can mean loss of hair and sickness for your pet, and dangerous illnesses for you and your family.